It seems to be pretty well agreed upon (which very rarely happens in the world of health and nutrition) that the darker a food is the more vitamins, minerals and nutrients it contains and the healthier it is. Blueberries, spinach, kale, sweet potatoes, salmon, tomatoes, pomegranates, olives, acai, etc. are all heralded for their rich color that indicates their dense nutrition. Conversely, white rice, white flour, white potatoes, white sugar, white salt, etc. are all things absent of color that we consider to be generally unhealthy due to the lack of nutrients. Every once in a while there will be an exception like cauliflower that people consider a good thing to eat but as a general rule, the darker the better. Question: Then why do we seem to think that things like white meat chicken/turkey and egg whites are 1) healthy and 2) better for us than dark meat chicken/turkey, beef, pork and egg yolks? There seems to be this acceptance of fact/truth in plant land that darker = better and when it comes to fish the same holds true (e.g. salmon>tilapia) but some how the opposite is now true when it comes to land based creatures. Does this make any sense? Meat with a dark, rich color is unhealthy and/or inferior to meat with an absence of color when in every other circumstance we consider color to be an indicator of nutrient richness and health? In doing this comparison it would appear that indeed the darker proteins have more nutrients to offer. Not surprisingly, liver was the big superstar, with egg yolks not far behind. 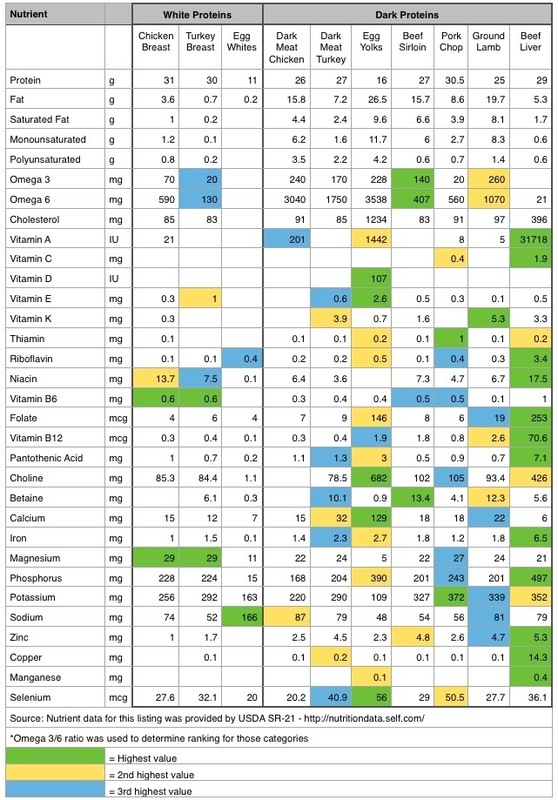 The only two nutrients that the white proteins led in? Vitamin B6 and magnesium. They were also higher in niacin if you exclude liver (which most people would!). Other than that, the dark meats really appear to be more nutrient dense (particularly in minerals), supporting the idea that darker equates to more nutrient density. Interestingly, conventional wisdom was challenged in two categories (that I don’t think matter much, actually): sodium and cholesterol. Egg whites were the highest in sodium by 2x over anything else and with the exception of egg yolks and liver, all the proteins had almost identical cholesterol levels. So what gives here? If “darker is better” logic is a given truth in plants and sea creatures and a simple nutrient analysis of proteins appear to support that idea being true in land animals, why is there a disconnect? Is it simply due to fat and/or cholesterol? There has to be a reason why this concept is incongruent and those are the two most likely reasons I can discern. Looking at fat, it is certainly true that the darker meats have more fat. But is that a problem? People are starting to realize fat (particularly saturated fat) is not a problem and the tide is beginning to turn back to what has been the common theme throughout most of human history: fat is good. If we think of fat as energy and a carrier of nutrients then it becomes an asset and not a liability. Secondarily, animals as a whole food have fat and have been eaten as a whole food for most of history. It’s only been in the last few decades that we’ve done it any differently by only eating the white meat and egg whites. In terms of cholesterol, if all animal meat has the same, there’s no need to use that as an excuse. Liver and egg yolks have high levels comparatively but this is a concern only if 1) you believe dietary cholesterol has anything to do with anything, which I don’t, 2) if cholesterol is so much of a concern to nullify the nutrients in egg yolks and liver unattainable in other forms and 3) if you believed that cholesterol and all the nutrients that come along with it in egg yolks and liver don’t work together to provide everything the body needs. I maintain a darker is better philosophy across the board when it comes to food. Whether plants or animals, I eat the darker ones more often because I think they have more to offer across the board and think the supposed drawbacks of things like beef, pork, lamb, liver and egg yolks, particularly fat and cholesterol, are misguided. I have no problem with the lighter color versions, in fact I think the best approach is to get a variety of colors and depth in the diet. A nice balance of colors in the plant kingdom and eating the whole animal is the most common sense approach in my mind. Chicken breasts and egg whites have something to offer, I just think they are more valuable when paired with the rest of the original source and less valuable when eaten in isolation. I would argue that the protein, vitamin B6, naicin and magnesium they offer good sources of are utilized by our body better when accompanied by all the nutrients that come in the rest of the animal. 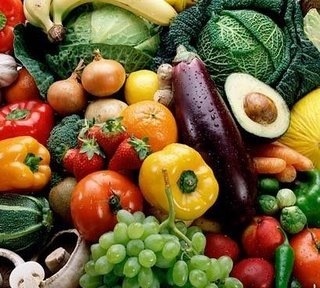 For my money, it would appear that the best way to maximize your nutrient intake and health is to honor the way nature has packaged things for us and focus on eating the most nutrient dense foods available, which seem to be whole foods and the darker they are the better.